Volunteers were helping Vincaire Minyer take a milkshake and a broiled egg from the pancake breakfast stall. 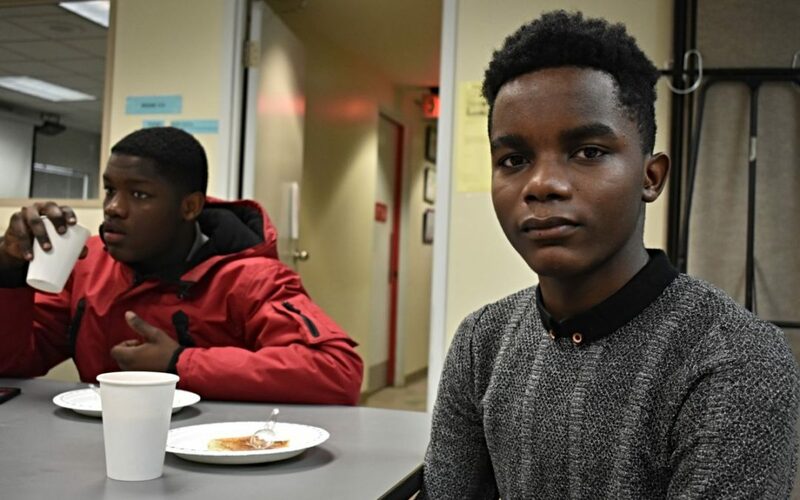 Vincaire, 16, is from Uganda, a country that is “not too hot, nor too cold,” he says. Canada’s cold weather doesn’t bother him much despite the harsh temperatures in this country. The snow doesn’t keep him from his activities. The pancake breakfast was one of the March Break events put on by the Catholic Centre for Immigrants’ Youth Program earlier this month. Vincaire came to CCI with his brother to participate in the day’s activities that included breakfast, a presentation by a dietitian, and yoga. Vincaire arrived in Ottawa four months ago and attended breakfast for each day of the March Break. He is in Grade 11 and goes to Saint Patrick School. His brother is in Grade 9. This was his first March Break in Canada. It was the fourth day of March break, and he had already visited three times to join the activities at CCI because it was an opportunity to make friends and have fun. He knows two languages: Swahili and English. In his country, he studied in an English-medium school that added to his English speaking skills. He is happy to get out of the long school-hours in Uganda. CCI’s Youth Program is aimed at young newcomers aged 14 to 29. The goal is to help them integrate and settle in Canada’s diverse culture. It also helps young newcomers set some longer-term goals in their lives. Its mission includes self-care, mentorship, leadership opportunities and training, education and recreation, social networking and employment support. The pancake breakfast was a tasty example of a Canadian breakfast that set Vincaire up for yoga followed by a group trip to the Food and Agriculture Museum.